Labor unions were dealt another blow in Kentucky after the state supreme court upheld its right to work law. The state's highest court upheld a lower court judge's ruling dismissing the lawsuit filed by Teamsters Local 89. The 4-3 majority affirmed that the law, which prohibits mandatory union fees as a condition of employment, passed state constitutional muster and was appropriate under federal labor law. "We hold that the Unions' constitutional challenges to the Act are without merit," the majority ruling in the 4-3 case says. "In this area of economic legislation, the legislature and the executive branch make the policy, not the courts." The union argued that right to work illegally denied it the employee dues and fees in violation of the state constitution. The legal challenge said the law would create a free rider problem in which non-dues paying workers benefit from union-negotiated wages, grievance procedures, and work rules, but do not have to pay for that representation. Local 89 did not respond to request for comment. Justice Michelle Keller, writing for the dissent, agreed with the majority that labor groups are not entitled to such payments. Her dissent instead focused on the fact the law was passed during a special session. She argued that special legislation must apply equally to all classes of Kentuckians in order to survive constitutional challenges. The law's exemption of workers operating under existing union contracts creates distinct classes of workers, according to the dissent. "The legislation is special in its operation because it only alters membership and dues for union employers and employees," her dissent says. "The RTWA would still be unconstitutional … because union employers and employees before January 9, 2017, are treated differently than those after that date." Chief Justice John D. Minton Jr. addressed Keller's dissent in a concurring opinion. He said the dissent's focus on special legislation "offends the doctrine of separation of powers" by giving justices boundless ways to define "class." He said the law applies equally to all Kentucky workers. "The RTWA does not differentiate treatment between, for example, labor organizations in western Kentucky versus those in eastern Kentucky—all labor organizations must refrain from forcing employee participation—so therefore the RTWA applies equally to all within the ‘class,'" his concurrence says. 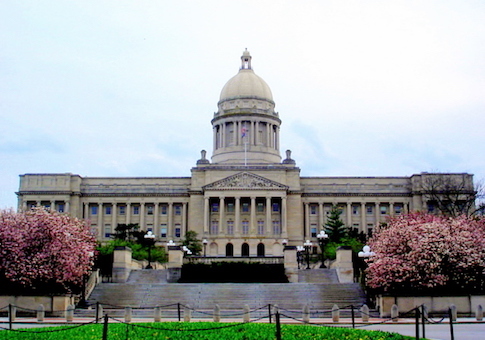 "I fear this Court risks overstating its role in Kentucky's tripartite government." Labor watchdogs welcomed the ruling. The National Right to Work Foundation, which represented several Kentucky workers during the case, said it was not surprised by the ruling. The laws have survived similar legal challenges in nearly every state where they have been adopted in both state and federal court. Nevertheless foundation president Mark Mix called it a "victory for Kentucky workers." "The Court rejected a desperate attempt by union bosses to re-impose their power to have a worker fired for refusing to pay dues or fees to a union they oppose," he said in a statement. "The Commonwealth's Right to Work law simply protects workers' freedom to choose and ensures that union membership and financial support are strictly voluntary." Local 89 did not respond to request for comment. This entry was posted in Issues and tagged Kentucky, Right to Work. Bookmark the permalink.